With only a smidge of new med info I figured its about time for a more "normal" life update. 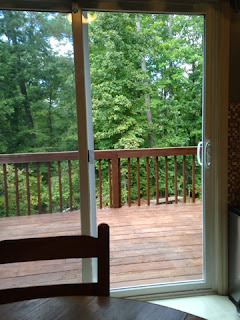 Mom and I have been living in the forest (aka Durham/Cary) for over a month now. Crazy! On one hand it doesn't feel that long and on the other hand it feels like it's been an eternity. The other day I was watching a YouTube video that was filmed possibly somewhere near home or a place like it and I realized just how much I miss big open spaces where you can sit under the shade of a tree but still be able to see for miles! live isolated in the mountains but right in the middle of suburbia! Aside from missing the view and of course all my friends, family and doggies, things aren't too bad her in NC. Fall has apparently started to arive and with it some very pleasant weather! Not too humid or hot! I haven't really spent much time outside though but it has made the walk from the house or rehab to the car much more pleasant and tolerable. Mom and I have been trying to find things to do to keep us busy on the weekends, which has been a bit of a challenge as I have hardly any energy left by that time but we have been doing a few things. A few weeks ago we met a lady at church who invited us over. It was so great to spend time with her and her family. She has two young daughters who are both so sweet and fun! They spent the evening thoroughly entertaining us! We also met up with a cousin of ours whom we had never met but who happens to live just minutes from the hospital. She is so friendly and we seem to all get along well. It is a bit strange to think we only just met a week or so ago, it seems like I have known her a long time. We had dinner with her one night and then also spent an afternoon wandering around Durham at at craft fair. I enjoyed both outings despite getting poured on most of the time at the craft fair. We have also spent a fair amount of time with my grandparents. That has been a nice change as I usually only see them once or twice a year. This year I am already up to four times and it has only been a little over a month. In fact it will be five times later today as we are meeting up with them for a bit this afternoon. They just got a new puppy and I am dying to see it! Other than our few outings I spend most of my time either at rehab or sleeping. I feel a bit like a baby with the hours I spend asleep. Its good that I have all this time to sleep since I am soooo tired most of the time, but it does get a bit frustrating because I usually like to go places, but instead I am so tired I stay home. Rehab is still going well. It has gotten increasingly harder to get myself to go. My mom and I sometimes sing the rehab song as we are pulling up with me saying the "no no no" part, as that is how I often feel. Despite my avoidance desire, rehab is still decent. I have been making friends there and it is nice to see them and talk with them each day. I am getting stronger which is good with me. Unfortunately the tasks never get easier as more strength simply means more weight but it is nice to know I am moving up and it is actually doing something. At the end of the day I feel pretty good, exhausted, but glad I did it. This past friday I officially graduated from rehab, which is basically another way of saying come at a different time. I am still waiting for The Call and have not had a single dry run since I got listed. It is a bit odd to me as I was thinking that this would happen fast and that I would have had at least one dry run by now. Each person on the list is given a score based on how sick they are and how well they would do with a transplant. I have a fairly high score and a common blood type as well as no antibodies. These factors make is more likely for a call to come quickly which is what my coordinator also thought. I took this as within a few hours or certainly a few days, but it has been almost a week and no call. I am beginning to realize that quick may have another meaning here. In the grand scheme of things if I am to get a call sometime in the next month that would be quick (at least for transplants). We came to Duke because of the short wait. When you are in it each passing hour feels like an eternity but if I compare it with the pretty much guaranteed over a year wait I would be facing at home, even 6 months becomes quick. Waiting is a very bizarre situation. The closest thing we can relate it to is waiting for a baby to be born. You know that it will happen, yet at the same time it seems a bit unreal. Add to that the uncertainty of time and the invisible leash that keeps you close to the hospital. With a baby though, you know that by the tenth month it will have happened, one way or another the whole thing will be done and the baby will have arrived. Unfortunately with us that is not the case. The call could come right now or it could come a year from now, we have no idea and all we can do is wait. The challenging part is trying to let go of the anticipation of the call and attempt to return to life. Each day that goes by is just that, a day. The sun rises, birds sing, creepy bugs craw (yuck there are so many of those here!) and we try to do things. The best is when we can forget that we are waiting for that life changing call to happen and simply go about our "normal" lives. It is incredibly challenging, I can't imagine what it is like waiting months or even years and yet there are people who are doing it every day. In medical news, the allergy test went fairly well. They gave me a does of iv Benadryl before starting the antibiotic which mostly took care of my reaction. I felt extremely drugged from the Benadryl which was not entirely pleasant but I guess it is better than being covered in hives and itching. Towards the end of the infusion I did begin to react a bit. I turn red, my face swelled up, my gums and tongue felt funny and my head itched. A second does of Benadryl took care of this almost instantly, though again with the drugged feeling. I am not sure if the docs will end up using this med or not, but the doc in the infusion center felt it would be okay to use with a double does of Benadryl. Tomorrow (if I make it with out getting the call....nah I'll make it) I have an appointment to see about changing out my G-tube. After transplant the docs here use GJ-tubes. These tubes are similar the the g-tube but they have an additional part that goes into the small intestines. They prefer this for after transplant as reflux into the lungs can lead to rejection and feeding into the intestines greatly reduces the chance of reflux (maybe eliminates it I am not positive on this one). A feeding tube is not always used after transplant but since I already have one the docs will use it. The unfortunate part about the GJ tube is that it is LONG. My tube right now is a small little "button" it lies mostly flat against my stomach and is hardly noticeable through my clothes. The GJ tube is a long maybe 12 inch tube that dangles out of your stomach, not exactly the kind of thing I am dying to have after trading in my oxygen tube for new lungs. Not being one to sit around and let things happening I did a little digging around and found that some G-tube companies do indeed make a small "button" form of the GJ-tube. I asked about it (stumping my coordinator :D ) and ultimately found that it could be a possibility. They will have to do some tests and look at my stomach to see if the small tube will work for me but if all goes well I should be able to get it. If you are the praying type please pray that this small tube will work and that the tests for it and getting in put in are fairly pleasant procedures. I would also love prayers for my transplant, that it happens soon, goes really well, I have no major complications (especially that the nerves to my vocal cords don't get cut :0 ) and that the lungs work well for me for a long long time! P.S. when The Call comes (really once we are in the hospital waiting around) I am planning to send out a quick blog letting you all know what is happening. During surgery and the beginning of my recovery I will have my parents update this so you all know what is going on! So be sure to check back. P.S.S just an interesting tidbit. The name for my blog came from my years spent in the hospital sitting, literally, in the window. My mom would call me the girl in the window. As my transplant journey meant new hospitals with different windows I naturally thought of the name On to New Windows!